With all kinds of news flooding the channels, thanks to the CES 2013, TheVerge had a chance to play with a demo unit running what presumably is the latest build of the Firefox OS. As far as hardware goes, it’s a low end phone with ARMv6 CPU and 256MB of RAM. Interestingly enough, it looks like FF OS will be restricted to the single core 800MHz processors at launch. Ever wanted to know what happened to web browsers before (and after) the world has come to an end? Well, now you can, we have the technology. 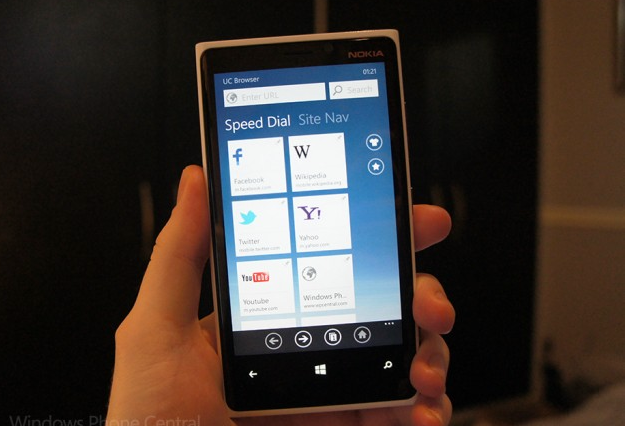 For both WP7 and WP8. With both platforms fighting for the third position in the mobile operating system wars, guys from the GadgetMasters made a brief comparison of Windows Phone 8 and BlackBerry 10 web browsers. If you don’t feel like watching the video, BB10 won in pretty much everything, including the HTML5 test as it scored 485 points compared to Internet Explorer’s 320. With releasing the very first update for its WP8 platform (Build 8.0.10211.204), Microsoft has also included a couple of minor new features for the IE10. First in the list is an ability to delete specific sites from your web browsing history. Lastly, Internet Explorer 10 users can now prevent pictures from downloading automatically, which will surely help them to squeeze more days out of their data plan. If you are curious to learn about other changes, see the following post. What better way to end the year than to remember and remind you about the company’s progress in 2012. This is exactly what Mozilla did and when you combine everything together, it does look impressive. For example: did you know that Firefox got over 100 new features in less than 12 months? How about close to 20,000 enhancements? While the majority of news this week were mostly about Firefox and Mozilla, it’s time to end that with the news from Google Chrome. Turns out, the search giant has just release an update for the iOS platform, which fixes one of the widely reported announces: inability to play audio files when web browser is minimized. Well, things are about to change as the latest build does just that: allows you to play audio while running in the background. Now here is something for the Android users. Guys from TomsHardware took massive list of Android 4.1 (Jellybean) supported web browsers and tested all of them. If you got confused by too many alternatives, this article should give you a pretty good indicator on who’s leading and who’s lagging in this area. You will be surprised, I promise. If not, you are not getting your time back. Yep, it’s that time of the month again. First on the list is Apple’s Safari web browser, which regained some of its lost market share, up from 60.31% to 61.50% (1.19 point increase).